Eastern Woodland Print Communications is committed to protecting personal information by following responsible information handling practices in keeping with privacy laws. Modern information and communication technologies support the activities of our company. Our Privacy Statement covers Eastern Woodland Print Communications and its Web site found at www.easternwoodland.ca. Because Eastern Woodland Print Communications wants your Web site experience to be informational and resourceful, our Web site also provides a number of links to third party sites. We collect personal data you volunteer on-line, or when you access our services, in order to better meet your program or information needs. We also use and disclose data, which does not identify individuals, for statistical purposes to develop and enhance our services. 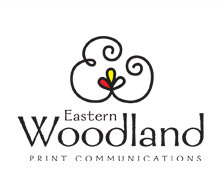 If you supply us with your mailing address, you may receive mailings from us with important information about Eastern Woodland Print Communications news or services. You may also receive periodic mailings from us with information about Eastern Woodland Print Communications that may interest and benefit you. If you do not wish to receive these other mailings, please contact us at (902) 752-0202 and ask for a copy of our opt-out form. Eastern Woodland Print Communications maintains physical, electronic and administrative safeguards that are appropriate to the type of personal information we obtain from you. Eastern Woodland Print Communications has access to personal data and are required to respect the confidentiality of personal data and handle personal information responsibly.